While I'd designed bank forms and small amounts of marketing material after graduating from La Roche College, Interactive Media provided me with my first opportunity to really "live" being a graphic designer. 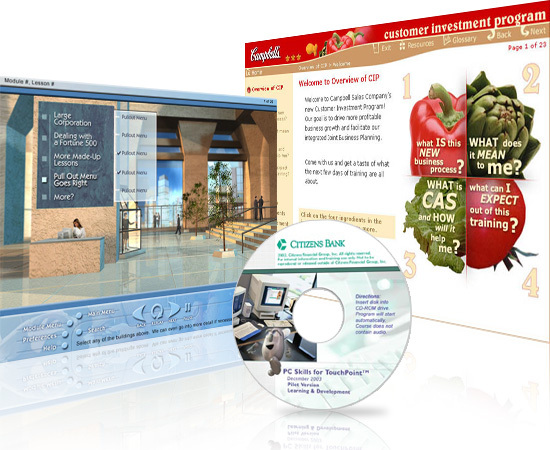 During the more than six years that I worked there, I was fortunate to design training interfaces and interactive designs for clients like; Campell's Soup, Tetra Fish, Verizon, PNC Bank, Citizen's Bank, AT&T, Sun Microsystems, and countless others. We had a great group of designers and working with them was one of the best experiences of my life. I also had a lot of interaction at this time with various high-end client brand guidelines, web, print, 3D, and really every type of design job you could imagine to start off my career in a well rounded way.